Now that that the Nine Days are over, we can again eat meat, considering it’s summer what could be better than something made on the grill? We’ve adapted the following recipe from Prime Time – The Lobels’ Guide to Great Grilled Meats. Put the potatoes in a large saucepan and add enough water to cover by 2 to 3 inches . Lightly salt the water and bring to a boil over high heat. Reduce the heat and simmer briskly for about 15 minutes until the potatoes are just fork tender. Drain and cool to room temperature . Cut into halves so that there are 12 pieces. Handle the potatoes gently to prevent the skin from slipping off. Combine the olive oil, garlic, and rosemary in a large bow, season to taste with salt and pepper . Add the potatoes and stir gently to coat. Prepare a charcoal or gas grill. Lightly spray the grill rack with vegatable oil cooking spray. The coals should be moderately hot to hot. Lift the potatoes from the marinade. Transfer the marinade to a small saucepan and heat gently until warm and fragrant. Thread the potatoes, steak, and peppers onto skewers, beginning and ending with a potato and threading 4 pieces of meat and 3 chunks of peppers onto each. 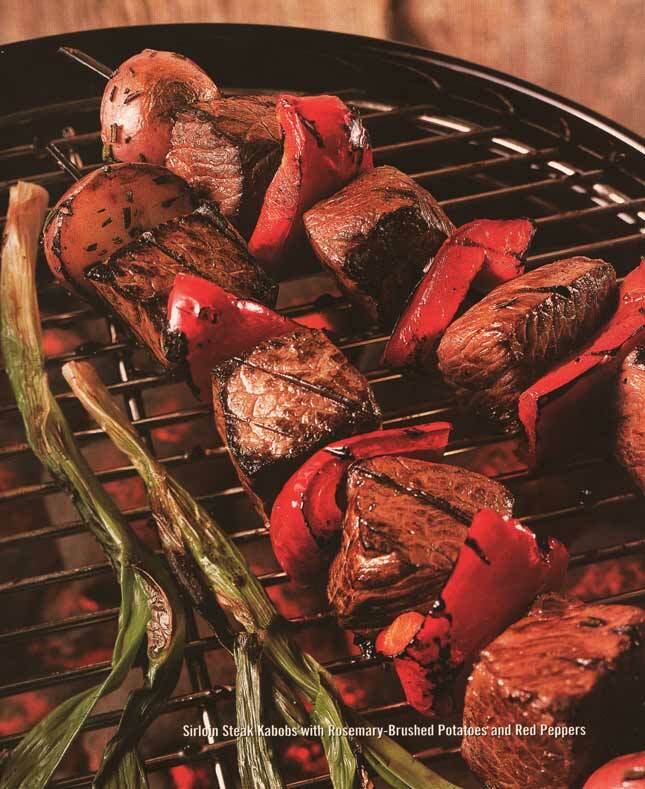 Grill for 10 to 12 minutes, turning several times and brushing with the marinade, until medium rare, or until the meal reaches the desired degree of doneness, the potatoes are tender, and the peppers are slightly charred. Serve immediately.